3D Printing no Longer Just for Prototypes? Moving from prototypes to finished goods? It appears 3D printing is finally making a big push from prototype to finished consumer good. 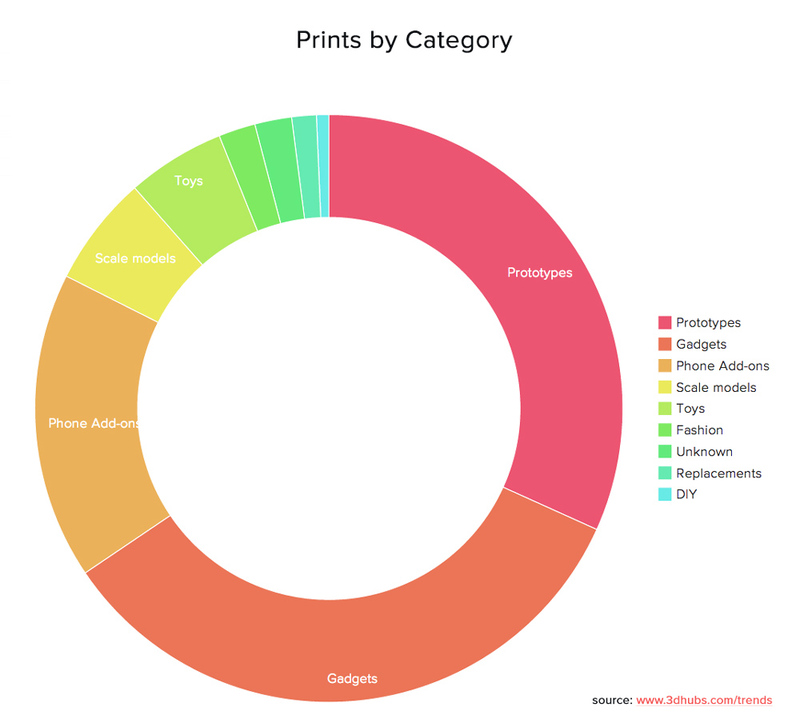 3D Hubs has a ton of excellent data showing things like the most common color for prints to the most common brand of printer, but what I found most interesting was the trend chart above. 3D printing has been around longer than your average person would realize, it can be measured in decades now, but for a very long time there was minimal chance the would run into a 3D printed good in a store or everyday life. This was because 3D printing was the domain of geeks, hobbyists and prototypes. Today, however, the news is filled with examples of end consumer products incorporating 3D printed elements from headphones, to jet engine parts to airplane support structures. What is driving this? In the case of MrSpeakers Alpha Dog headphones, it’s the ability to produce structures not available in injection molding techniques allowing for superior sound. For GE’s LEAP jet engines it’s the ability to make a lighter and stronger nozzle more efficiently and/or not possible otherwise. For Airbus’s A35o XWB it is the ability to make a greener airplane with a lighter part made with an environmentally smaller footprint. Today many of the finished goods you’re likely to bump into are cell phone cases and novelties, but in the next few years we expect more amazing products not able to be made any other way. Do you have a cool example of a 3D printed finished good? Feel free to share it in the comments below.